Thank you to Jill Tietjen, co-author of the bestseller Her Story: A Timeline of the Women who Changed America, for this post. The photo is from the Library of Congress. The “First Lady of Physics” Chien-Shiung Wu spent much of her life after her retirement encouraging young women to pursue scientific careers. Although she proved the theory of the conservation of parity (put forward by two men who were her colleagues), they won the Nobel Prize; she did not. Chien-Shiung Wu was born and educated in China and came to the U.S. to pursue her graduate studies. She obtained her Ph.D. from the University of California at Berkeley and met her husband there. They moved to the East Coast where Wu taught at Princeton University and Smith College in Massachusetts. During World War II, she was asked to work on the Manhattan Project, which developed the atomic bomb. After the war, she stayed at Columbia University as a research assistant. Although she did not win the Nobel Prize, she did receive many other honors and wrote a book (Beta Decay) that was the classic textbook in nuclear physics for many years. She became a full professor at Columbia in 1958. Later, she received the first honorary doctorate that Princeton awarded to a woman. 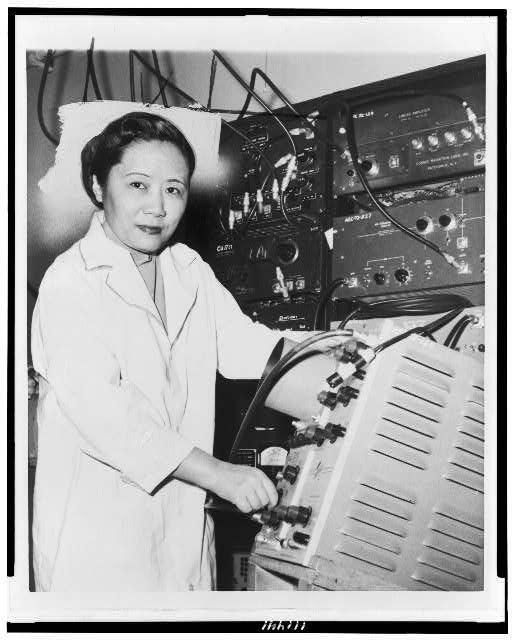 Wu was the first woman elected to the American Physical Society as well as the first woman to receive the Cyrus B. Comstock Award of the U.S. National Academy of Sciences. She was also a recipient of the country’s highest scientific honor, the Medal of Science (1975). Wu had an asteroid named for her, the first time such an honor went to a living scientist. She said: it is shameful that there are so few women in science… In China there are many, many women in physics. There is a misconception in America that women scientists are all dowdy spinsters. This is the fault of men. In Chinese society, a woman is valued for what she is, and men encourage her to accomplishments yet she remains eternally feminine. Her son also became a nuclear scientist. Here is a link to more information about Wu’s work at Columbia as part of the Columbia250 celebration. Dr. Wu taught at Columbia University, not Princeton. She became a full professor at Columbia in 1958, and Princeton gave her an honorary doctorate in the same year.